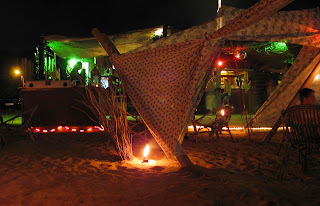 One of the pleasures of Spain in summer is the proliferation of chiringuitos/xiringuitos (beach bars) along the coast. One or two stay open all year, but most are literally picked up and transported away somewhere during the colder months. Apart from offering refreshments to bathers they also play an important role in delivering electronic music, particularly in Catalonia. A walk down the 5km stretch of beach front between the new five star Hotel Vela and the Forum will take you past about 20 chiringuitos with almost all of them blaring out some kind of electronic music, usually down tempo house suitable for a sunny beach atmosphere, but it is not rare to find a bit of drum n bass occasionally while one closer to the Forum even manages to sneak in a bit of techno. 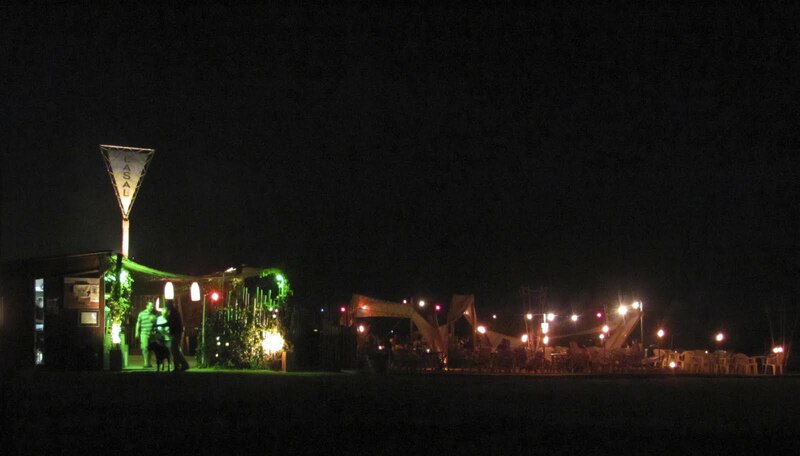 At night and further afield things get a little different. 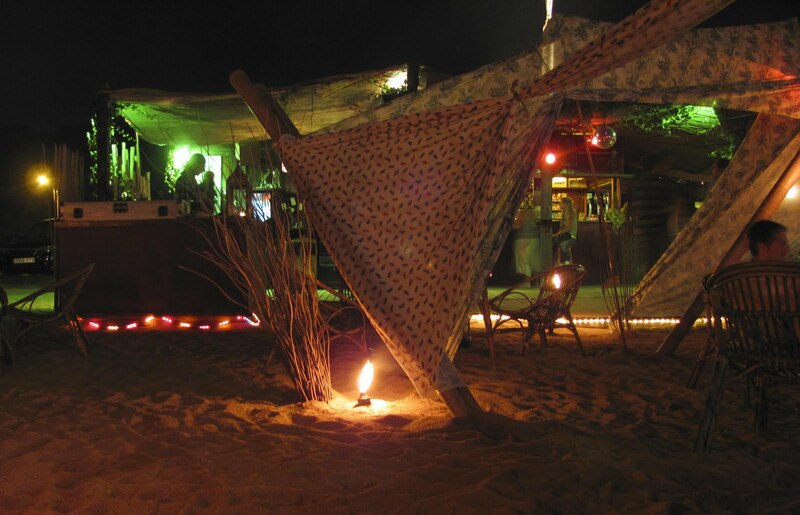 Some chiringuitos have become specialised centres for delivering music and stage special events, many lasting all night like a conventional club, the only difference being you are on the beach where the trappings are much more cutre (rough or make-do). For example, this weekend XirinGO in Prat hosted a dubstep breakcore party run by Trash van Traxxx a lovely woman from Madrid who tried to move into my old flat before I moved out! Many host important Off-Sonar events during the week of the festival. One of the more respected chiringuitos is La Sal which is located in the small Costa Brava town of Arenys de Mar, about 50 minutes on the train north from down town Barcelona. I made the journey up the coast alone on Friday night to have the chance to see Rhythm and Sound (now just Mark Ernestus) and Paul St Hilaire, the artist formerly known as Tikiman. I saw them play there two years ago and it was a real treat despite some sound problems with the microphone. The bar had undergone a subtle rearrangement during the intervening years, but otherwise it was outwardly the same as before. The lighting was low, brightest at the bar with little oil lamps lighting the sandy garden out the back. Various cloths had been draped over poles in places like a nomad’s tent to provide some cover, but otherwise the sky and near-full moon was the ceiling. The crowd turned over consistently, neither fast nor slow and was a beguiling range of people. The night opened with some children on the dancefloor, later replaced by a midget, while a table of retired pensioner couples sat next to me. By the end of the night there was still plenty of older people milling around which didn’t make me feel like some tipsy deviant perched on the edge of the dance floor, but there was still plenty of young people from the village well dressed for a foray on the beach. Ernestus and Tikiman remained in the green lit corner of the bar by the front entrance for the whole show, Ernestus barely moving at all, while Tikiman flitted in and out to smoke joints and talk with the people. The music was a blend of loops and samples ripped off classic reggae tracks or constructed in silico, sometimes played over other tracks in accompaniment and other times alone in more pure R&S “electric” mode. There were frequent interludes where Tikiman would not perform and Ernestus would just play like an old fashioned selector, cross fading one track into another. Ernestus seemed to play the volume in slow waves, bringing it up for one track and then taking it down slowly over several more. Then, almost imperceptibly he would set the arc upwards again creating a languid biorhythm for the music. All the time he barely moved as if his hands were somehow merged and manacled to the knobs and faders of his machines. Tikiman on the other hand was always a presence, moving in and out, dancing, changing clothes as he grew hot or cold and talking to the odd visitor coming and going. At times he even uses his body to shape the sounds, jerking and bent over to squeeze more air from his lungs or to add to it tremors and micro movements. Lyric wise he varied between classic roots calls for Babylon and Jah to reggae’s skat like improvised gibberish, pure vocal sounds always touched up here and there by little runs of echo from Ernestus. 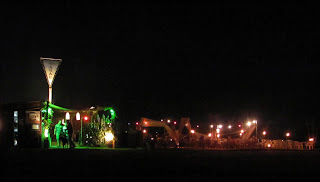 Being alone, I sat back in the garden for most of the show, content to watch and write a letter to my friend. I later joined the dwarf and others on the dancefloor as the moon grew higher and the waves further away. A true mid summer nights eave.